Direct Response Copywriting: Poor feedback: what would you do? If the brand has been taking care of its community, fans will sing praises about the brand. If yelp is not a part of that network, super fans will step in and help. On the other hand, if le brand messed up, people will not be shy telling their network about their sad experience. I found this on my network and decided to blog about it earlier today and decided to write about it. Since I have the commentluv plugin installed on this blog, someone, somewhere, somehow has bookmarked my blog for commenting. 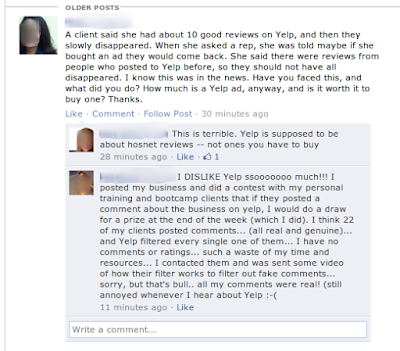 If one of those commenters also had a negative experience with yelp, they too will comment on this blog about their sad plight. What's worse, they might also write a blog about their first-hand experience with yelp. Now this is where the "Streissand Effect" kicks in. If Yelp chooses plan C, I have no recourse but complain to my social network (facebook, better yet: reddit), and/or write about it in this blog. Someone then picks it up, adds to it, shares. Rinse, then repeat. 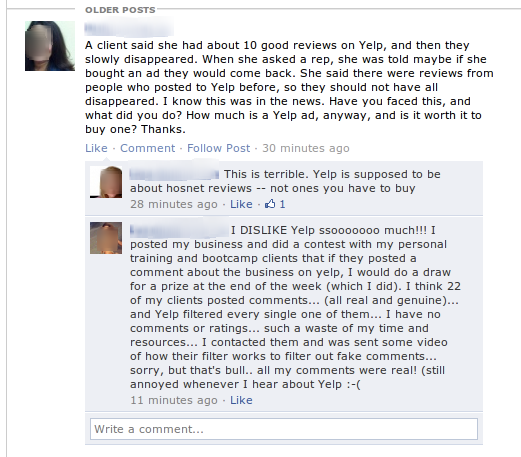 What do you think is the best way for yelp.com to handle this situation?